Most investors miss the most important concept in wealth management because they are laser focused on returns as the primary benchmark of success. This propensity to chase returns is magnified during periods when markets are shooting the lights out, as investors become acutely aware of how their portfolio is performing relative to whatever index is attracting the most attention at the time. Under the emotional pressure of watching the markets rise, a nagging feeling starts to take hold of clients that drives a creeping dissatisfaction with their Advisor. During the tech bubble, it’s, “Why aren’t we keeping up with the Nasdaq?”. During the real estate bubble it was, “I can do way better than this flipping houses.” Now it’s, “Why don’t we load up on more dividend stocks?” Same refrain, different focus. At times like this we like to spend a lot of time revisiting the core reasons that compelled our clients to hire an Advisor in the first place. For almost all of them, the core reason relates to their desire to reach one or more financial goals at some point in the future. Many are hoping to support children in university, and/or eventually retire with a comfortable lifestyle. Some clients are already drawing income from their portfolio, and are primarily concerned with ensuring that their portfolio doesn’t expire before they do. Most investors imagine the wealth management process as a smooth ride from here to retirement. According to this illusory vision, investors unfailingly set aside exactly what they committed to put aside each year, and markets keeping up their end of the bargain by delivering the long-term average return year-in and year-out without exception. In reality of course, life sometimes gets in the way of savings, and the markets do NOT move in a straight line from A to B.
Fortunately, by examining the distribution of historical returns we can estimate the range of likely outcomes for portfolios around the long-term average return, or any other return estimate we wish to use. Once this range is known, we can determine the probability of a successful outcome – however we define success – within the range of possible outcomes. In this way, the wealth planning process becomes an exercise in risk management, but the risk is focused on the probability of reaching financial targets, rather than on the risk of short-term losses. An example should serve to illustrate this point. Imagine a 55 year old husband and wife couple with $1 million in retirement savings, and who hope to retire in 7 years at age 62 to an inflation adjusted pre-tax income of $120,000. They have committed to saving $60,000 per year in support of this goal. They have a hard liability that comes due in seven years. The value of that liability is currently unknown, but we know that the liability is the amount needed to support $120,000 per year in income through death, adjusted each year for inflation. The investment policy should be engineered with the exclusive objective of minimizing the risk of NOT achieving this retirement income goal. What is the appropriate way to approach this problem? First, we need to identify how long the couple are likely to live. To be conservative, we generally model to the wife’s age at death, because women live longer than men on average. From Statscan mortality tables, we may know that the average 62 year old woman is expected to live through age 85, but this means that 50% of women will live to be older than 85. If we plan to 85, then there is a 50% chance that they will outlive their money. This is obviously unacceptable. To be prudent, we generally plan to a 90th percentile lifespan assumption, which means that there is still a 10% chance of outliving the plan, but this number is flexible, and subject to guidance from clients based on parents’ lifespans and other factors. From the same Statscan mortality tables we can determine that a 62 year old woman will live to age 88 about 10% of the time, so this age is our 90th percentile estimate. So the question is, if we have $1 million now, and save $60,000 per year from age 55 to age 62 when we retire, what is the probability that we will have enough to draw $120,000 (inflation adjusted) per year from our portfolio from age 62 to age 88 without running out of money.? Traditionally, this analysis is often conducted with extremely improbable assumptions. Leaving aside the low probability of achieving long-term average rates of return over the next decade or more, traditional plans also generally fail to account for the volatility of investment returns. In contrast, most plans assume the portfolio will generate precisely the long-term average return year-in and year-out, without exception. As a result, a typical analysis looks something like this (though with fancier paper, colour graphics, and detailed monthly after-tax projections). Notice that all of the numbers in the table are in today’s dollars (in other words adjusted for inflation in the future). The 7% return is assumed each year, along with 2.5% inflation. The couple starts with $1 million per our scenario above, which grows each year as a function of (return – inflation) + savings of $60,000 per year from age 55 through 61, and then depletes at the rate of (return – inflation) – withdrawals of $120,000 until death at age 85. We shaded the region from age 86 – 88 because many traditional plans model to the median age at death rather than the more conservative 90th percentile. You can see that under traditional assumptions the portfolio still contains ~$295 thousand at the end of the traditional retirement horizon at age 85, and fully depletes about half way through the 88th year. Investors who plan for retirement with this plan will feel confident that their saving and investment goals will be met. However, as we will see below, because of the impact of volatility and sequence of returns risk, this plan is actually likely to fail about 40% of the time. You can see that the app has been updated to reflect the scenario we described above. The couple is currently 55, and they plan to retire at age 62. We have applied the historical returns and volatility from a U.S. portfolio consisting of 60% stocks (S&P 500) and 40% 10 year Treasury Bonds over the full period, and assumed no discount for fees, taxes, or current yields or stock valuations. The initial capital is $1 million right now, and we assumed that they are not planning to leave any money behind (Target Legacy = $0). Monthly savings are assumed to be $5,000 per month, which is $60,000 per year. Inflation is set at 2.5% over the pre- and post- retirement period. Finally, the Remaining Lifespan Confidence Interval is set to 90%, in keeping with our discussion above. The right hand part of the screen with the charts contains all the information about the results of this plan. In reality, the app is generating 5,000 possible future return paths for the 60/40 portfolio given historical returns, volatility, and correlation. Then it applies savings during the pre-retirement period, and withdrawals during the post-retirement period. In all, we have 5,000 possible wealth trajectories for this couple from today at age 55 through the 90th percentile lifespan at age 88. 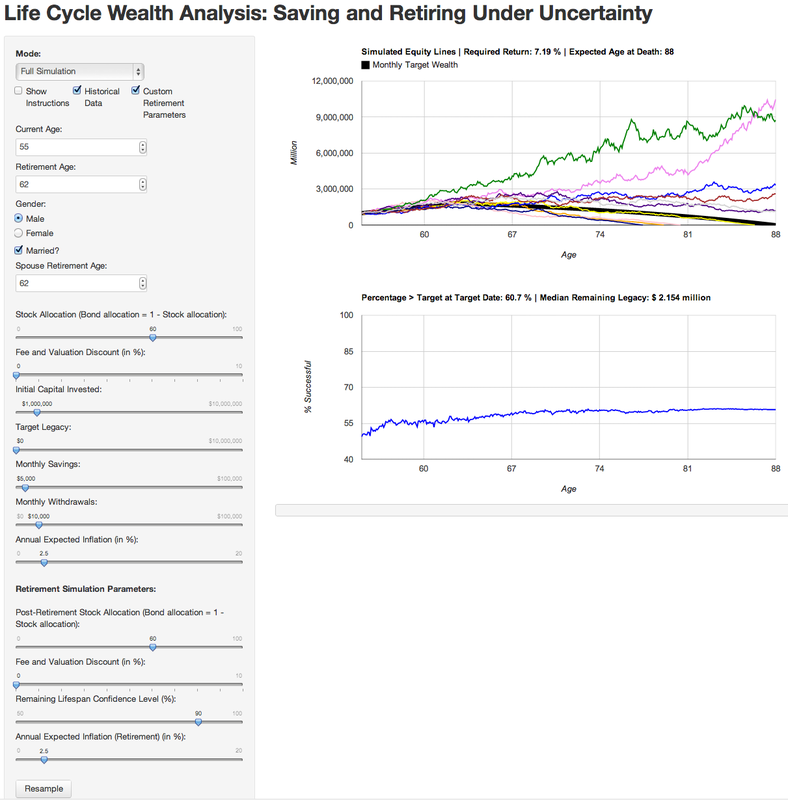 The top chart shows 10 random wealth trajectories out of the 5,000 that were generated. 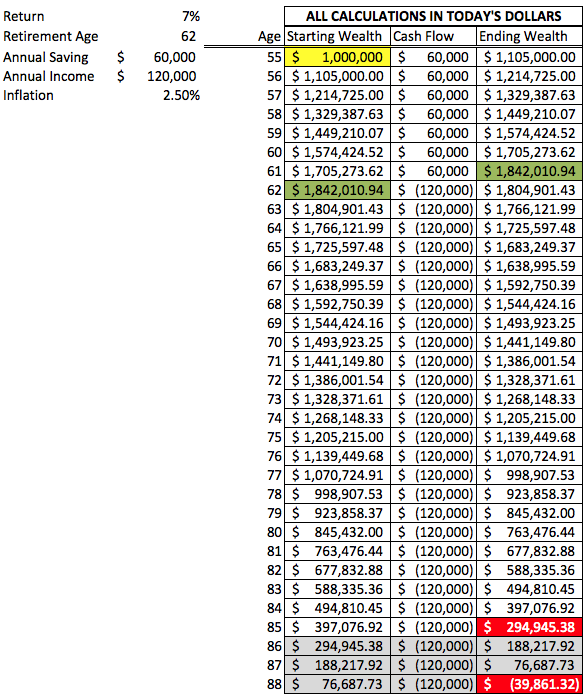 The thick black line shows the ‘ideal’ wealth trajectory which results in exactly $0 on the wife’s 89th birthday. Where a colored line finished above the black line, that counts as a successful future; where it falls below it is a failure. Note also the information in the title above the top chart. Given all of the assumptions, the couple will require an average return of 7.19% over the entire period to be perfectly successful; this is the return that is used to generate the thick black line on the chart. You can also see the expected age at death – 88 – at the prescribed level of confidence (90% in this case). It is difficult to evaluate the probability of success from the top chart, but that’s what the lower chart is for. It shows the cumulative percentage of all 5000 random wealth trajectories that are above the black line at each month over the full investment horizon. Where the blue line intersects the far right of the chart, this is the proportion of portfolios that are above the target level at death (in this case the target is $0 at death because there is no legacy). The title above the chart gives the salient statistics. You can see that only 61% of wealth trajectories achieved a successful outcome given the assumptions we used. Perhaps counterintuitively, the median remaining legacy for this couple is $2.154 million. This is simply the 50th percentile value of all 5000 wealth trajectories at the wife’s median expected age at death: age 85. Obviously, a ~40% failure rate is intolerable for most people, since the consequences of running out of money are so severe. There are a number of things that can be done to improve the overall probability of success, including raising the savings rate, pushing out retirement to age 64 or 65, or taking a lower income during retirement. The app has optimizers that allow us to discover exactly how much needs to be saved, the target size of the next egg, or what level of income will be supported if savings can’t be increased and retirement can’t be delayed. Of course, another way to improve the probability of a successful outcome is to adopt a better investment approach, preferably one which limits downside volatility but preserves the opportunity for long-term growth. In fact, our Adaptive Asset Allocation methodology was engineered with these qualities specifically with retirement and sustainability realities in mind. The future is uncertain, so your plan must be able to adapt to changing circumstances. A core objective of the app we show above is to help people come to grips with the random nature of life and the investment process. Most investors imagine the saving and retirement process to be smooth and predictable. This illusion feeds into the sorts of retirement plans we see all the time from new clients, where monthly wealth, cash flow, taxes, and every facet of a person’s financial life are mapped out with extreme precision decades into the future. Unfortunately, these types of plans are not very helpful. They trade accuracy for precision. We can’t know precisely where we’ll be, in life or financially, many years into the future, but with the right tools we can forecast the likely range of possibilities, and do our best to maximize our chances of success. And that is, after all, the most important concept in wealth management.